A sharing meal that's so good you won't want to share it! Be transported to the Mediterranean with this moreish, modern Greek dish. There's nothing better than a delicious, juicy steak fresh off the BBQ. This spring, make lamb steaks your go-to; the tender and flavoursome meat will be the hero your next meal and every one after. Available in a variety of cuts including leg and rump, lamb steaks are perfect for the BBQ, pan-frying or stir-frying. The versatility of this cut makes it the best choice for a range of recipes – from your simple BBQ grill to gourmet crowd-pleasers. 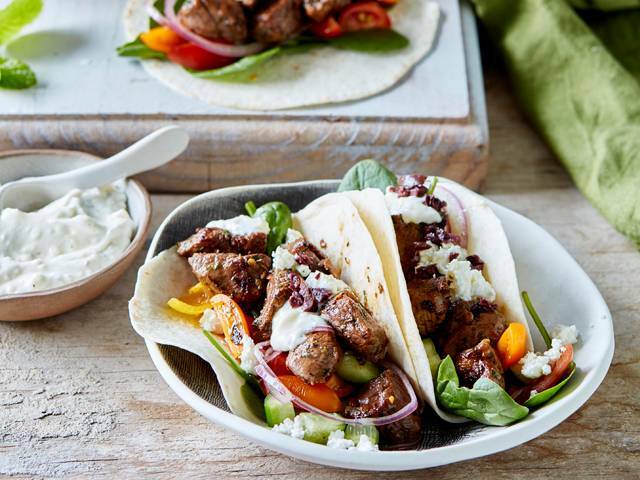 Australian Lamb has created five recipes to tickle your tastebuds including Greek lamb and feta tacos, Mongolian lamb bao and Chilean marinated lamb that are guaranteed to satisfy at any meal occasion, big or small. Place lamb, oil, garlic, oregano, mint and lemon juice in a large snap lock bag. Season and shake to coat. Set aside for 10 minutes. Heat a large non-stick frying pan over medium-high heat and cook lamb, turning, for 4-5 minutes, until browned and cooked to your liking. Set meat aside on a plate, cover with foil and rest for 5 minutes. Meanwhile, heat taco shells or tortillas according to packet directions. To serve, divide lamb, baby spinach, onion, tomato, cucumber, feta and olives between tacos or tortillas. Serve with tzatziki, mint leaves and lemon wedges. Visit Australian Lamb for more recipe inspiration.